The general manager of the Shibden Mill Inn has been named a finalist for The British Institute of Innkeeping (BII) Awards. Glen Pearson has impressed the judges and is now in with a chance of being named Licensee of the Year. 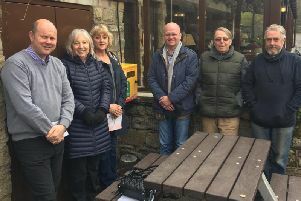 As one of six finalists, Glen and the Shibden Mill Inn have been through audits on food hygiene ratings, independent social media audits, mystery customer visits and welcomed the judging panel to the premises. Glen then faced a panel judging day and was quizzed by industry experts in four areas - marketing, industry affairs, finance and people training. Glen said: “I am absolutely over the moon to have been named as one of six shortlisted finalists for this year’s prestigious BII Licensee of the Year Award. Licensees entered from across the UK, with Glen and the other finalists successfully demonstrating through a number of stages their expertise in the pub and hospitality industry. All finalists will be presented with trophies at the BII Summer Event on June 7, when the overall winner of Licensee of the Year 2016 will be announced.